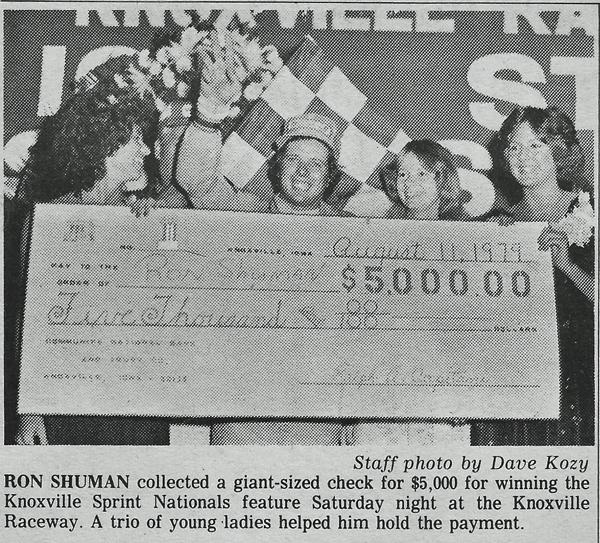 Knoxville, Iowa (August 11, 1979) – “The Flying Shoe”, Ron Shuman of Mesa, Ariz., was flying in high gear as he won the 30-lap A-main, which highlighted the four-day 19th annual Knoxville Sprint Nationals at the Marion County Fairgrounds. Polesitter Tim Green of Des Moines led the early stages of the feature with Shane Carson of Oklahoma City running second and Shuman in third. After taking second from Carson, Shuman was allowed to close in behind the pacesetting Green when the yellow flag came out on lap 9. Green successfully defended his lead when all-out action resumed and remained in front until lap 15, when a broken rocker arm stud forced him to slow his pace, allowing Shuman to claim the top spot. Green would withdraw from the feature moments later and be credited with 18th place in the 21-car field. Once in front, Shuman never relinquished the lead, surviving a lap 24 caution flag and restart, and then sailing to the win. 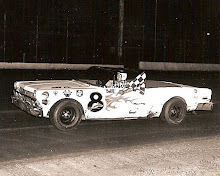 Randy Smith brought home second place and Sammy Swindell of Memphis, Tenn., took third. Swindell turned in the outstanding performance of the evening. He started at the tail of the field after winning B-main and used both the low and high groove to wind his way through the field. John Stevenson of St. Paul, Minn., was fourth and Shane Carson rounded out the top five. 1. 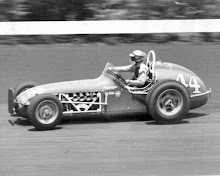 Ron Shuman, Mesa, Ariz.
3. Sammy Swindell, Mesa, Ariz.
6. Danny Smith, Danville, Ill.
9. Lee James, Northridge, Calif.
10. Larry Clark, Tolleson, Ariz.
11. Buster Bernard, Putin, Calif.
12. 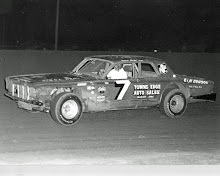 Paul Pitzer, Seven Valley, Calif.
14. Bill Mellenberndt, Sioux Falls, S.D. 16. 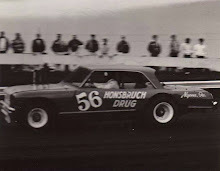 Lee Osborne, Jamestown, Ind. 17. 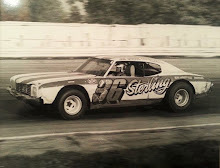 Doug Wolfgang, Sioux Falls, S.D. 19. Steve Kinser, Bloomington, Ind.